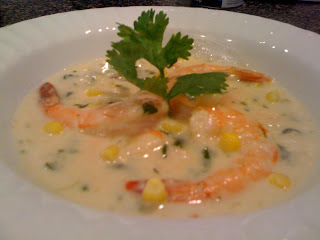 Last night I *FINALLY* got around to making the Shrimp, corn and coconut soup w/ roasted poblanos !!! Place poblanos on a skewer and blacken them over the stove top burner. Put them in a bowl and cover with plastic wrap to steam a little. When cool, rub off the skin with a paper towel or peel the skin off with your fingers. Mince the poblanos. Heat olive oil and butter in a four- to five-quart pot over medium heat until hot but not smoking. Then sauté onions and celery and fresh corn about four minutes*. Add flour, cilantro and garlic and cook for three minutes stirring occasionally. Add wine and prepared diced poblanos stirring frequently. Add coconut milk, coco Lopez and the rest of the ingredients and simmer for fifteen minutes. Ladle soup into bowls to serve. 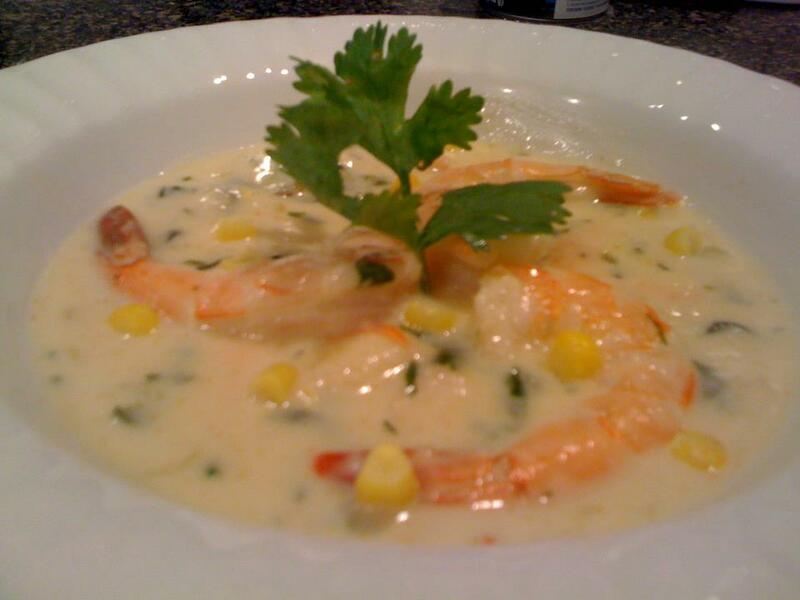 I first sampled this recipe at the Chefs of the Coast stockpot cookoff in Biloxi, MS. Chef Chris has effectively created a "party for the mouth" with this soup!! The first thing that I notice taste wise is that the flavours meld together perfectly, while still keeping their own uniqueness. As I sampled the soup I could detect the sweetness from the coconut, the heat from the poblanos, the burst of cilantro, and the creaminess from the brie cheese & cream. The flavours seemed to dance in my mouth! It has a bit of a kick combined w/ a perfectly balanced sweetness. I made some slight changes in the method of preparation. I'm not lucky enough to have a gas stove, so I cranked up my oven, placed the poblanos on a cookie sheet and allowed them to roast in the oven for about 10-15 minutes. While the poblanos were roasting, I sauteed the onion, celery and 1/2 cup of corn. *Once sauteed I took this mixture and blended it up for added creaminess. Afterwards I transferred the blended mixture back to my stockpot, and added the remaining 1/2 cup of corn and finished cooking per instructions. Thank you to Chef Eric for sharing this recipe!!! !